The period of time from the introduction of a product to its decline and stagnation. Different analyses posit different numbers of stages in a product life cycle (usually four to five), but all emphasize that a product has a beginning, with technological innovation; a period of rapid growth; maturity and consolidation; and, finally, decline and possibly death. For example, in the video cassette recording (VCR) industry, the mid-1970s were a period of decentralized technological innovation, with VHS and Betamax formats vying for dominance. Later, video cassettes very quickly became a common household item. In the maturity phase, different companies selling VCRs attempted to corner a greater market share for their own (identical) versions of the product. Finally, VCRs declined and were eventually supplanted by DVD players. A product life cycle can be prolonged by several factors, including opening new markets to the product, finding new uses for the same product, or even attaining government subsidies. The concept of a product life cycle applies most readily to the sale of goods, and it is difficult to gauge how it works in a service economy. Fig. 68 Product life cycle. Product B is launched before product A declines. A1 shows that product life may be extended by product modification. The typical sales pattern of a PRODUCT over time from its introduction on to the market and its eventual decline as it is displaced by new, more innovative products or until demand for it falls, due to a change in consumer tastes. decline. This phase is characterized by falling sales. If left to follow this downward path, the product will eventually die as sales fall to very low levels, although long before this the firm may withdraw it from the market. However, the rate of decline may be slow and protracted in the absence of rapid technological change and bolstered by entrenched customer tastes, so that suppliers may continue to earn good profits from the product. (See ENDGAME STRATEGY). In view of the product life cycle, firms must not only pay particular attention to how best to exploit their established products at various stages of their life cycle, but, importantly, must formulate appropriate PRODUCT RANGE strategies so as to provide for a balanced portfolio of new products, growth products and mature products. Thus, for example, as demand for product A begins to decline the firm must have already launched new products such as B as part of a regular programme of new product launches (see Fig. 68). In addition, it may be possible to modify an existing product such as A in order to extend its life cycle as depicted by A1 in the figure (SEE PRODUCT MODIFICATION). See NEW-PRODUCT DEVELOPMENT, OBSOLESCENCE, BOSTON MATRIX. Fig. 158 Product life cycle. (a) See entry. 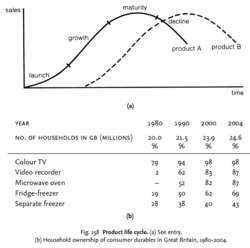 (b) Household ownership of consumer durables in Great Britain, 1980–2004. product decline, where sales begin to decline as consumers’ tastes change or superior products are launched. If left to follow this downward trend, the product will eventually die as sales fall to low levels, although long before this managers may decide to phase out the product. Most companies market a number of different products and must formulate a product-range strategy, providing for a regulated process of new product launches, with new products, like B in Fig. 158 (a), growing as older products, like A, reach maturity, so as to maintain an appropriate PRODUCT MIX of newly launched products, growth products and mature lines. A company's pricing policy for a product may be related to the stage of the product's life cycle. During the launch phase, managers will tend to opt for a high skimming price, which capitalizes on the new and distinctive nature of the product and the temporary monopoly power that these convey. In this early stage, demand for the product is likely to be less price-elastic (see PRICE-ELASTICITY OF DEMAND), for high prices will not deter high-income pioneer consumers. Furthermore, a high price will reinforce the quality image of the largely untried product as well as recouping research and development and heavy promotion expenditure. During the growth phase, managers may change to a low penetration price, lowering the price to bring the product within reach of the mass of consumers. At this stage demand is likely to be more price-elastic, for the average consumer is more price-conscious than the pioneer consumer. By lowering price, the firm can expand sales appreciably, gaining cost savings from large-scale production, and can maintain a large market share in the face of entry by competitors. Once the maturity phase is reached, with several similar products firmly established in the market, then prices will tend to stay in line with one another as any attempt by one firm to reduce its price and expand its market share will provoke retaliation as competitors fight to maintain their market share. Similarly, other elements of the MARKETING MIX, such as advertising and sale promotion, need to be adapted to the phases of the product life cycle. The product life cycle concept can also be extended to highlight changes in the sales profile of whole MARKETS and INDUSTRIES from birth through maturity to decline. For example, Fig. 158 (b) shows market penetration for a number of consumer durable products in Britain. See also BOSTON MATRIX, PRODUCT PERFORMANCE. A procedure supporting the preparation of the requirements list considering whole product life cycle on early design stage is proposed. Polli and Cook (1969) conclude that this presumed sequence of sales characterizes the "weak assumption of the product life cycle model" and that in addition "the expected proportion of time spent in each stage represents the strong assumption of the product life cycle model". Wood (1990) concurs that, by establishing the prospect of decline, the product life cycle may become a self-fulfilling prophecy with valuable brands being prematurely discontinued. Dhalla and Yuspeh (1976) also identified several other problems with the product life cycle model. In a similar vein, Levitt highlights some shortcomings of the practical application of the product life cycle concept, on the presumption that the purpose of the concept is to establish the stage of one's product in the cycle and then select the strategy befitting that stage. Even where companies look to the product life cycle, they will be basing their plans only on the small section of the cycle in which they reside at the time, rather than covering the entire life of the product. In Mercer's (1993b) survey, 49 per cent of managers attached the value of the product life cycle to new products and a quarter attached it to the decline stage, while none referred to the mature stage. To assess the latest price optimization solutions throughout the product life cycle, Forrester applied its Wave(TM) methodology to offerings from the five leading vendors. Vendors were rated in each component of the product life cycle across three dimensions -- functionality, strategy, and market presence. Overall pricing -- offers overall visibility and recommends optimal pricing along the entire product life cycle.